Costochondritis is inflammation of the cartilage connecting your ribs to your sternum (breastbone). The pain can feel like the sharp, stabbing or pressing, aching pain of a heart attack. You should seek emergency medical care if you have any heart attack symptoms. However, if your diagnosis is costochondritis, it is generally considered a harmless condition. The condition lasts from a few days to up to a year for some people, though most cases resolve within a few weeks. While it lasts, you may wish to try conventional treatments and natural remedies to help ease symptoms. Costochondritis is a painful condition caused by inflammation in the cartilage that connects the ribs to the breastbone. This area is known as the costochondral joint. The condition may also be called chest wall pain, costosternal syndrome or costochondrondynia. When there is swelling present, the condition is called Tietze syndrome (also known as chondropathia tuberosa or costochondral junction syndrome). In most people, the left side is most affected. The symptoms often mimic a heart attack, so accurate diagnosis is essential. Always call a doctor or go for emergency care if you have chest pain. The condition is fairly common, affecting about 200,000 people per year in the U.S. In most cases, the cause of costochondritis is unknown. Thankfully, the condition does go away on its own in time. It usually takes a few days to a few weeks for costochondritis to resolve, but some people have symptoms for up to a year. In general, costochondritis can have very distressing and sometimes debilitating symptoms, but it is not considered a medically serious condition. In fact, when it happens in isolation, it is considered harmless, other than the symptoms it causes. However, because its symptoms overlap so much with potentially life-threatening conditions, you should always seek professional medical evaluation for chest pain that seems to be costochondritis. How is costochondritis linked to other diseases? Costochondritis does not lead to cancer. However, swelling caused by Tietze’s syndrome may be mistaken for cancer in some cases, or vice versa. In addition, existing tumors in the chest area may irritate the rib cartilage, causing costochondritis pain. In severe cases or chronic costochondritis, numbing medicine or corticosteroids may be injected directly into the painful rib joints. This can ease pain and relieve inflammation. Costochondritis treatment plans may also include recommendations for physical therapy and rest. Costochondritis relief is possible. For many people, symptoms disappear within a few days to several weeks. No matter how long you have to cope with costochondritis symptoms, you may wish to try some natural approaches to managing the pain. Conventional costochondritis treatment and natural remedies may work well together, too. Always consult a healthcare professional before starting or changing a treatment, exercise or diet plan — including herbs and supplements. Many natural remedies can interact with NSAIDs, insulin or other common medications. There are many videos and websites demonstrating helpful costochondritis stretches or physical therapy. 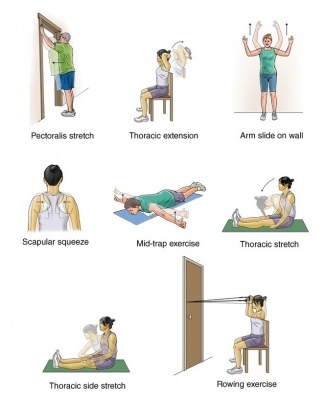 In general, the exercises focus on stretching the arms, thorax, back and chest muscles. Wall slide. Stand with your back against the wall. Raise your arms up so that your fingertips point to the ceiling and your elbows are raised about shoulder height. Keeping your arms against the wall, raise them up overhead. Hold and then lower to the start position. Repeat 10 to 12 times per session. Scapula squeeze. Stand straight and tall, reaching your head toward the ceiling and breathing comfortably. Squeeze your shoulder blades together and hold the squeeze as long as it feels comfortable. Release. Repeat five to 10 times per session. Stretch the pecs. Stand just outside a doorway and reach your arms up as high as you can on either side of the frame. Supporting your weight with your hands, push your chest and body straight forward. Keep your abs tight so that your back doesn’t wobble or arch. Hold for a few seconds and return to the starting position. Repeat five to 10 times per session. Thorax stretch. Sit down with your legs straight out in front of you, keeping your back nice and straight. With your hands on the floor at the side of your thighs, lean forward slowly. Curve down over your legs so that your bellybutton moves toward your spine. Hold for a few seconds and slowly sit back up. Repeat five to 10 times per session. Side stretch. Starting in the same seated position as you did for the thorax stretch, except place your hands on your lower thighs. Bend your right arm and lean forward. Try to get your right elbow down to the knee on that side, allowing your hand to slide across to your left leg. For extra stretch, hold your elbow on the inside of the right knee, using the pressure between them to turn your chest further toward the left. Slowly release and return to the start position. Repeat with the left side of the body. Alternate sides, stretching each side 10 to 12 times per session. Costochondritis pain and inflammation may respond to heating pads or ice packs. Do not use heat or ice for more than 15 minutes at a time. Wrap the heat or cold source in a towel or washcloth to help avoid skin damage. Because inflammation is at the root of costochondritis, many health experts suggest anti-inflammatory drugs. If you prefer a natural approach — or if your doctor says it’s safe to take certain herbs and supplements in addition to your prescribed or over-the counter medicines — you may wish to fight inflammation with diet and other natural remedies. Try an anti-inflammatory diet. The foods discussed below have proven anti-inflammatory effects, and may have numerous benefits beyond fighting inflammation. They are also rich in nutrients. Focus on a diet rich in a variety of vegetables and fruits. Particularly good options include berries, grapes, green leafy vegetables, tomatoes, pineapple, bok choy, cherries, avocadoes, broccoli, peppers, mushrooms and beets. Get plenty of healthy fats via walnuts, fatty fish (such as salmon or mackerel) and olive oil or coconut oil. Incorporate chia seeds and ground flaxseeds, cocoa or dark chocolate into your diet. Season foods with bone broth, turmeric and ginger to get an extra anti-inflammatory boost. Consider anti-inflammatory herbs and supplements. Please note that some of these interact with NSAIDs, steroids, diabetes drugs and other medications. Always discuss vitamins, herbs and supplements with your healthcare provider before making any changes. Avoid things that make the pain worse, such as particular positions, deep breathing, hugging, sleeping on your stomach, singing, getting out of breath, etc. Sternum pain can be very persistent. However, both the Mayo Clinic and the National Health Service (of the United Kingdom) suggest that TENS can be an effective pain relief method for some people with costochondritis. Unless you already have a confirmed diagnosis, costochondritis pain should not be diagnosed or treated at home. Seek emergency evaluation for chest pain and other symptoms of costochondritis. Symptoms may easily be mistaken for a heart attack. If your pain changes, gets more severe or does not respond to treatment, contact your doctor. Many natural therapies for costochondritis can interact with common medical treatments for the condition. Always work with a healthcare professional to get the right balance of natural and medical therapies for you. Costochondritis is an inflammatory condition that causes chest pain. Symptoms may mimic those of a heart attack, but true costochondritis is a fairly harmless condition. In many cases, the cause of costochondritis pain and inflammation is unknown. In some cases, however, it is caused by infection, manual labor or heavy lifting, strenuous physical activity, a tumor or systemic disease. With or without treatment, costochondritis normally goes away within several weeks. However, some people have symptoms for up to a year. Medical treatment of costochondritis involves NSAIDs and physical therapy. In some cases, it may require pain medication, steroid injections or other drugs.